You are currently browsing the tag archive for the ‘52 Men’ tag. Sometimes I buy a book and find myself wishing I’d written it (while at the same knowing I couldn’t, because, well, I’m someone else and I can only write the way I write – disappointing though that can be when I was hoping for something more like Jeanette Winterson or Haruki Murakami). Louise Wareham Leonard (New Zealand-born but mostly New York-based) is one of those writers whose books I always wish I’d written. 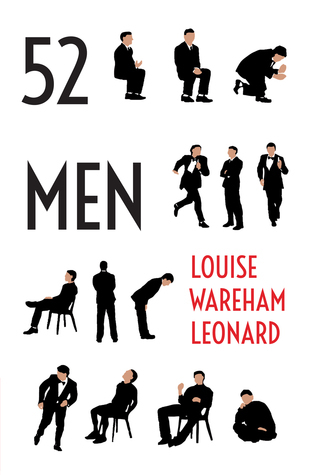 I loved her novels: Since You Ask and Miss Me A Lot Of and I’ve been just as impressed with her latest work, 52 Men (published by Red Hen Press). 52 Men is a series of vignettes involving main character Elise’s interactions with different men, followed by a longer piece concerning disturbing events from her childhood and teenage years. The vignettes would each stand alone as flash fiction, but together they form a mosaic of Elise’s life, each encounter building our understanding of her as a person. So you get the depth of character development you might expect from a novel, but in a series of snapshots. It’s an interesting technique and it works. In further crossing of genres, the author describes 52 Men as autobiographical fiction, which I take to mean somewhere between the remembered and the made up. But wait, there’s more! Louise Wareham Leonard invited other women to record a short piece of their own writing about men and launched a series of podcasts. The recording I contributed (I Meet A Man in a Bar) was based on a piece I wrote twenty years ago and recently rediscovered. You can listen to 52 Men the Podcast on Soundcloud.